Speedball’s rich, vivid calligraphy inks are formulated from the best pigments on earth. 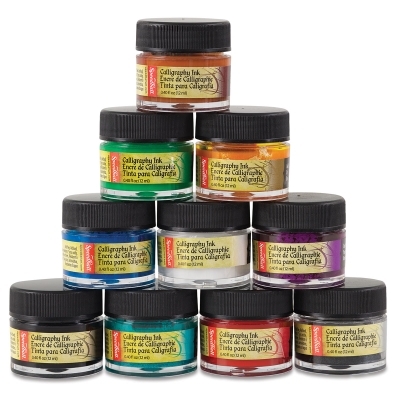 These high-quality inks can be used for a variety of techniques, enabling artists, students, and crafters to achieve the best possible results. 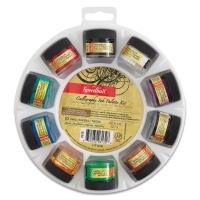 Every Speedball Calligraphy Ink color is intermixable with the other colors in the range. 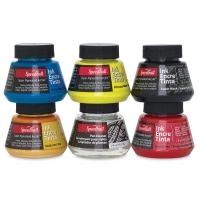 Waterproof when dry, the inks are also acid-free and very lightfast. Individual colors come in 2 oz (59 ml) plastic bottles. Set of 10 — This set includes 10 colors in 0.41 oz (12 ml) glass jars, plus a 9" Dia palette with 13 mixing wells. The colors include Black, Red, Blue, Green, Brown, Gold, Teal, Silver, Purple, and White. 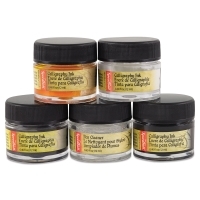 Set of 5 — This set includes four colors in 0.41 oz (12 ml) glass jars, plus a 0.41 oz (12 ml) jar of Pen Cleaner, and a palette with 10 mixing wells. The colors include Black, Gold, Silver, and White. 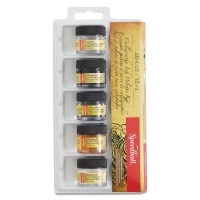 Set of 6 — Set includes a 2 oz pen cleaner and five 2 oz acrylic inks in Primrose Yellow, Scarlet Red, Indigo Blue, Super Black, and Gold.